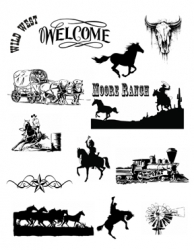 OVER 166 VECTOR ART DESIGNS In this CD artwork package, our SCM artists have managed to bring to life memories of the old west, its people, Steam locomotives, lifestyle, wildlife, etc. Each artist rendering is remarkable in its authenticity. You can see the detail in the covered wagon, experience the cowboy as he races around the barrel, or lassos a calf, horseshoes, skulls and much more. See the family homestead with the majesty of the mountains in the distance. Each image is of the highest quality and what you have come to expect from SCM. We invite you to welcome this artwork CD into your collection. You will not be disappointed.